Andre-Marie Amphere born in Lyon, France, January 20, 1775. He never attended school. Education obtained at the home of his father who was a wealthy silk merchant and government officials who support the king. 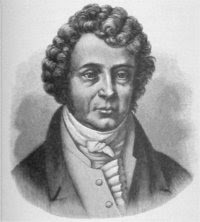 At the age of 12 years, Ampère had mastered all the mathematics known at that time. No wonder if he was a teenager intelligent and knowledgeable. Revolution occurred in France. In 1793, when he was 18 years old, a battle between supporters of the king in his town and the supporters of the republic. Befall poor royalist. His father was captured and beheaded by supporters of the republic gilotin knife. At age 24 he married and has one son. Because of his intelligence, he was appointed professor of physics at Bourg for two years (1801-1803). He was happy, all-sufficiency, and dignity. Unfortunately, the happiness of home life they do not run long. When the child reaches the age of four years, his wife died. Since then he turns into a morose and desperate. After the death of his wife, he too Get into Paris and taught at the Ecole Polytechnique. He lived in Paris until the end. Ampere interested in the findings of Oersted, Danish physicist, who invented the compass needle move when placed near a wire (conductor) the electricity flowing. He was soon experimenting. From these experiments he found that the coil is of a bar magnet. Changes in the soft iron becomes a magnet coil and coil containing iron rod into a powerful magnet. Two of the wing adjacent to the conductor of electrical current will issue each style. Amperejuga discover mathematical laws to calculate the force. This law became known as the law of electrodynamics and the basis for the creation of Maxwell's electromagnetic theory. Ampere left the paper in the form of a book titled Observations Elektodinamika Bridges with Africa (1822), and the Theory of Electrodynamics Phenomenon (1826). Both are in French. On June 10, 1836 Ampere died in Marseille, France. Written on his tombstone, which means finally Tandem Felix happily. That said, most of his life passed in distress.